Gone are the days of mercury based thermostats that only offered temperature control. These have been replaced with modern, digital control centers that do everything from provide weather forecasts to control humidity. 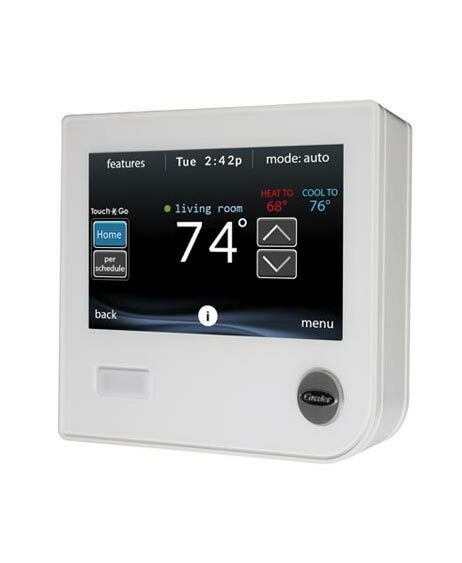 The right digital thermostat for your home can save you money with programming and/or auto-learning features. Remote Internet access also allows you to control your system when you're not even there, which saves on those days that you're late for work and forget to turn the A/C down! Let us help you select the right thermostat for your specific system. Some homeowners have lost substantial amounts of energy savings due to an improperly installed thermostat that didn't control their system correctly. 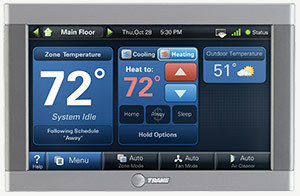 Trane is an industry leading manufacturer of Thermostats, and their ComfortLink II is a digital masterpiece. Giddens has chosen to build our solutions on the solid foundation of Trane equipment, as they align with our commitment to offer our customers the finest in Tallahassee air conditioning solutions! See below for information on Trane's elite line of Thermostats, or call us at (850) 562-0300 to have all of your questions answered! This is not just a thermostat. It's an energy command center. Trane ComfortLink II is an easy-to-use, programmable control that gives you remote access, live weather and more, all on a beautiful color touch-screen display. The Trane ComfortLink II control is an advanced command center that puts your comfort literally at your fingertips. It's the product that Popular Mechanics dubbed one of "The Year's Most Transformative Products," awarding it their 2010 Breakthrough Award. Connect your ComfortLink II control to a matched Trane system for complete, seamless comfort. Every component is designed to work in harmony with the others, optimizing your energy use over time. Not only does the ComfortLink II monitor indoor and outdoor temperatures, so you can adjust your system to be energy-efficient, but it also tells you when it's time to change a filter or schedule routine maintenance.